We have two big family reunions coming up this summer, and my kids' excitement over these reunions almost trumps their excitement over the new baby that's coming...I said ALMOST! Because we don't get to see most of our cousins very often, I decided we should spend FHE getting reacquainted with their faces and talking about our memories of each family member. Since my side of the family is having their reunion first, we started with the Hatches, and we'll do the Christensens in a separate FHE. Disclaimer: My camera battery died, so I had to use my phone, but the finished tree looks pretty cute! First, I printed off recent photos of each family member, and Guy and Autumn helped me cut them out and lay them face-down on the carpet. We sang Families Can Be Together Forever, then Steve and I talked about the families that we came from. We asked the children to guess how many brothers and sisters we each have and then asked them to name some of their cousins and tells us something that they liked about each relative that they could name. After they shared what they liked about (or shared a memory of) someone in the family, that child was allowed to select a picture from off the floor to tape onto "Our Family Tree". They announced the name of the person in the picture (if they knew it!) and shared something about them. Then they wrote the person's name under their photo. We grouped photos by family on our family tree. 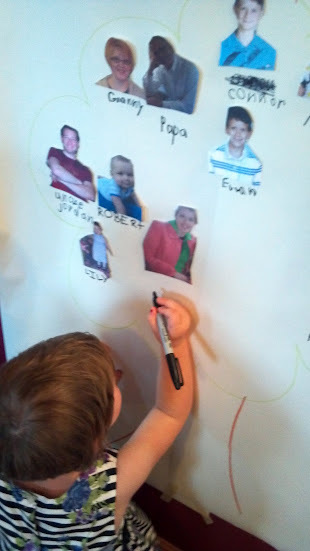 This was a fun, hands-on activity that really helped the children to understand "who are the people in our family?" and what their relationship is to each other. Guy said, "Sam and Cody always play games with me." Scarlett said, "Henry is a baby, and Uncle Hank played a game catching us at Granny's house." We will keep the family tree up and talk about it from time to time in order to reinforce the children's connection to their aunts, uncles, and cousins. Please take a minute to check out what went down in FHE over at That Good Part! What a great idea! I bet they had a blast. Hubby and I don't come from large families - at all - so I don't think there'd ever be a family reunion like this in our future. But I love the idea of using this as an FHE when our son (and any other kiddies!) are a little older. Yes, you should...all for the sake of having a big reunion!! :) ha ha! The kids and I really did enjoy making our family tree and praising each family member. Good fun! Wonderful idea! We, too, have 2 family reunions this summer, and I have twin 4yo boys who know some of the family members, but we haven't seen most of them for 2 years. So they don't know remember them at all. I think we will do this for FHE in the coming weeks. The hardest thing is going to be getting current pictures of all the cousins! Family is not always great at getting pictures out. Thanks for the idea! Same here...we haven't seen a lot of the family in two years. I grabbed a bunch of the photos from people's facebook pages! Another great idea for next week! Thanks J! What a great activity! My little girl hasn't even met most of her cousins. We just live to far away... I love your FHE idea! I love this idea of how to prepare for a family reunion! This is a great idea - not for the kids, but for me. My wife has so many aunts, uncles, nieces, nephews and cousins that I cant keep track. We've only been married 25 years, so she shouldn't expect me to remember everyone - right? I love this idea! My son gets extended family confused a lot since we only see them a couple of times a year, but he loves looking at pictures, and this is a perfect FHE! My post today for the Family Celebration blog hop was a family tree poster. Had I seen this post first, we may have gotten around to the project much sooner :) But it's done and we are learning our extended family member names and relationship connections!